The Tutor : THE TUTOR bows at Spirit of Broadway! 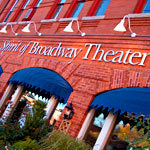 We are delighted to announce that THE TUTOR makes its regional premiere in February '07 at the remarkable Spirit of Broadway Theatre in Norwich, Connecticut, as part of the theatre's 10th anniversary season. The show runs February 28th through April 8th. Many thanks to SBT's founder and artistic director Brett Bernardini for including our show in what promises to be a truly fabulous season. The casting notice is up at the SBT website, so click here for audition dates, character breakdowns, and to find out how to get an appointment. Costume designers, MDs, percussionists and stage managers can click here for info on how to submit your resumes. In the meantime, check out Andrew's Meet John Doe blog for the latest news of his adventures at Goodspeed, where he and collaborator Eddie Sugarman are currently workshopping up a storm in preparation for a production at Ford's Theatre that opens in March '07. Also drop by Maryrose's website for news of her next novel, Why I Let My Hair Grow Out (also a March '07 release—yes, it'll be a busy month! ), the madcap maneuverings of Floridian book-banners and more.